You put the lads in the coconut and drink it all up…Doctor; these two dudes from Hollywood have taken the old-fashioned lemonade stand to new heights. Aiden and Mason (sons of Hollywood go-getter Maggie Viola) have taken to entrepreneurship with hip and healthy results. After vacationing in the Dominican Republic the youngsters realized coconut concoctions were in their future. Blending philanthropy with their business acumen, the youngsters donate 10% of every sale to the Coco Bros Scholarship Fund, which provides underprivileged families a Coco Bros Stand—allowing a new generation of youths the opportunity to hop on-board the brand bandwagon (and make some moola in the process). 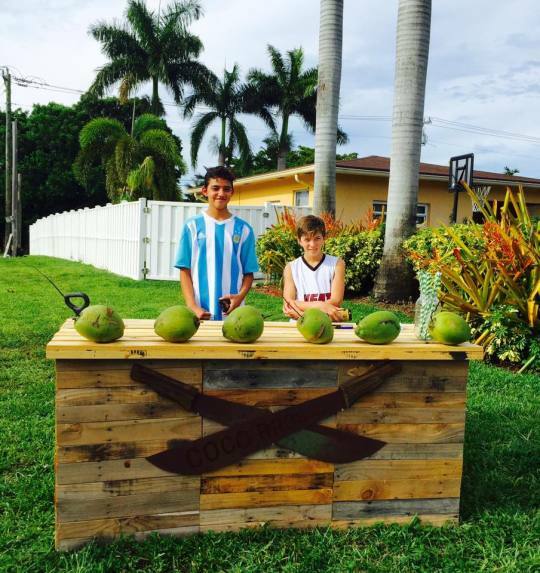 Currently Aiden and Mason’s stands can be found at any number of events around SoFlo (a bottled version of their farm fresh coconut water will be available soon). In the meantime, for more info or involvement email them at: [email protected] or call 914 374.1700.